When Northwestern State softball coach Donald Pickett evaluates his 2019 roster, one word comes to mind – depth. 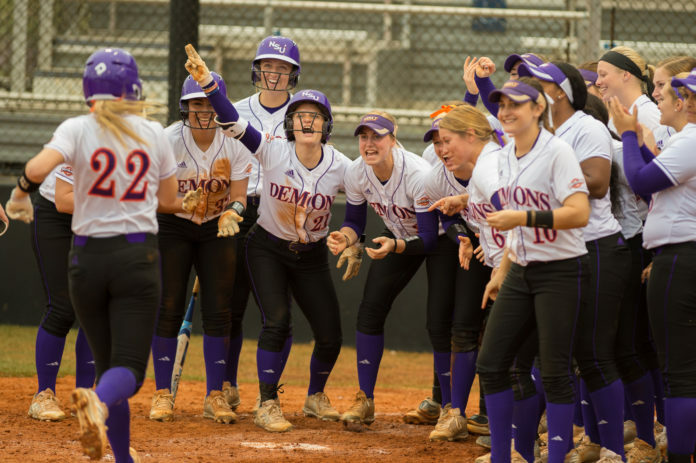 After attempting to transition into more of a small-ball philosophy centered around base hits and base running, Pickett said his Lady Demons look more like the power-filled lineup that was the cornerstone of Northwestern State’s three consecutive Southland Conference titles from 2013-15. “We have been hampered in that the past couple of years,” said Pickett, who enters his 11th season in Natchitoches as the program’s career wins record holder at 267. “We did try to get faster and work on the short game stuff to be more consistent, but now we’re getting back to what we were when we were one of the top teams in the league. Not only does NSU have more power hitters, but the Lady Demons have more options in general at nearly every position. Fourteen letter winners return from a 28-win team that made its second straight SLC Tournament appearance, and the Lady Demons have its sights set on a high seed in 2019 with the tournament coming to Natchitoches. “We do have more options, and a lot of that has to do with us being a lot more healthy,” Pickett said. “The key is we want our kids to get better every day and be consistent. Pickett said his group of three catchers is the deepest NSU has ever been behind the plate during his tenure. Two-year starter Emma Hawthorne clubbed 33 RBIs as a sophomore, but she’ll be pushed by sophomore Codi Vernace and freshman Alexis Perry. Whomever wins the starting position, Pickett said the other two could find other spots on the field or in the lineup because of their bats. “What’s so great about those kids is that they can do a lot of other things,” Pickett said. “They are all working at first base and in the outfield. Vernace provided pop with nine RBIs in 44 at-bats, while Perry is a two-time all-state catcher in Texas. Reigning Louisiana Freshman of the Year Cayla Jones will aim for an encore performance as a sophomore second baseman. Jones was an NFCA All-Region First Teamer and an All-SLC performer after hitting .378 with 10 home runs and 36 RBIs. “The first thing is not to press, take what they give you,” Pickett said. “If (opponents) want to put Cayla on base, we just have to take it. The left side of the infield has newcomers who are leading the race for the starting position. Sophomore shortstop transfer Nikki Skerlong was an All-American at the NJCCAA-D-II level at Hinds Community College with a .496 average, 53 RBIs and 56 runs scored. Junior Toni Hebert (54 career starts) will be a factor. Freshman Maggie Black is the front-runner at third base out of Grapevine, Texas. Sidney Harris was the primary corner in 2018, and Harris will compete at that spot and at first base. In the first base competition, Harris will be joined by any one of the three catchers and freshman Riley Cantrell among others. Harris delivered 26 RBIs despite missing several weeks with an injury. Cantrell has been a Max Preps All-American and all-state performer in Texas. She led the state in home runs as a junior. “Competition at so many positions has brought a little more focus to everything we’ve done,” Pickett said. “Now they do know there’s somebody behind them, and somebody that’s capable of helping us win. “Everybody knows that they have to bring consistency or they will be over there watching. Nobody can be satisfied or complacent, and it’s been a huge thing for us because they are pushing each other each day in practice. Junior Hayley Barbazon moves from first base to center field and will be counted upon to provide leadership in the outfield. She’ll have help in junior Kaitlyn St. Clair in left field. St. Clair got her chance to start midway through the conference season and hit her way onto the all-conference team. St. Clair had 12 of her 23 RBIs in 11 SLC starts. “St. Clair doing what she’s done goes a long way with her teammates,” Pickett said. “She’s accountable and dependable every single day. Right field will be a battle between junior Elise Vincent, the catcher Vernace and freshman Casey Irvin, who impressed in the fall. When pitcher E.C. Delafield isn’t in the circle, she could find a home in the outfield as well. After seasons in which the NSU pitching staff had only two or three real options, Pickett said this staff has as many as five arms that can be placed in a variety of situations. Pickett said the days of riding arms like Mikayla Brown and Micaela Bouvier are over. “The way softball is going, you have to pitch with a staff now,” Pickett said. “It’s like a baseball mentality now, and you have to keep teams off-balanced because offenses are so dynamic now. Brown is a fifth-year senior who posted a 10-9 record in 2018, improving her career total to 41. Sophomore E.C. Delafield has made strides after compiling a 4-4 mark as a freshman. “Hopefully we’re in a situation where Brown doesn’t put so much pressure on herself to be perfect,” said Pickett of a pitcher who was the 2015 SLC Pitcher of the Year. “When you have just one or two arms you’re using a lot, sometimes they put so much pressure on themselves that they have to do it. “E.C. had a great fall, and we’re looking for big things from our two young pitchers (Bronte Rhoden and Sydni Larrieviere) and junior transfer Samantha Guile. Guile, a Bossier City native, started two seasons at Southern Utah.